Aerial Photo of Shiloh (Khirbet Seilûn). Photo by Barry Kramer. Used by permission of ABR. Shiloh or Shilo (Khirbet Seilûn) is a large site so you may need to narrow your survey a bit. The site has not been excavated in many years, but since 2017, is being excavated by the Associates for Biblical Research under the direction of Dr. Scott Stripling. It is an important site since the tabernacle was located here for a number of years. Remember to provide "the historical background of the site (including history of previous archaeological excavations, if any), objectives of the current excavation, progress at the site, and significance of discoveries to biblical study. " Make sure to choose a good encyclopedia, journal articles, and books that specialize in the subject. This will give you a broad cross–section of material. See also The Shiloh website. Week Five Season one 2017 discoveries. For a Occupational overview and many nice photos of the site see Bible Walks. For the altars at Shiloh see Bible Walks. More information can be found at Emek Shaveh website. Israelite houses from about 1050 BC. 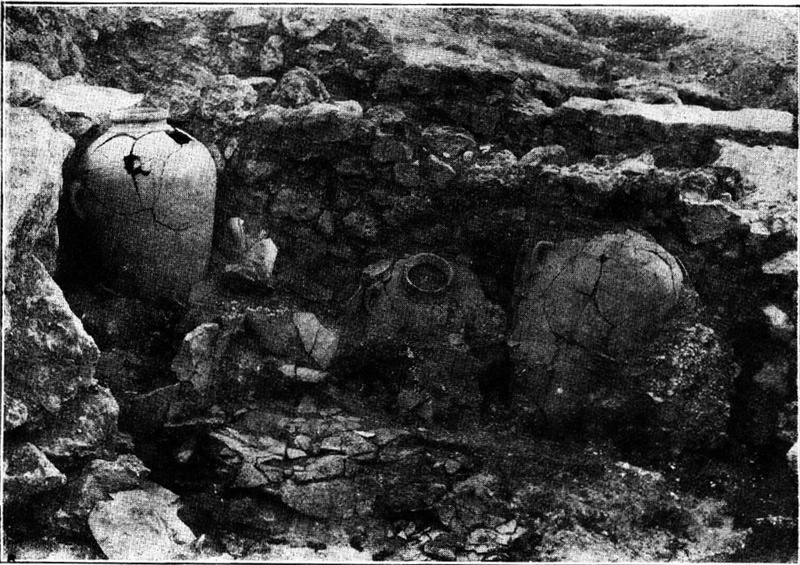 Large vessels in situ. Wall of house in the background. Kjaer, Hans Andersen. 1929.” Palestine Exploration Quarterly 63, no. 2 (1931): 74. Ackerman, Susan. “Who Is Sacrificing at Shiloh? The Priesthoods of Ancient Israel’s Regional Sanctuaries.” Pages 25–44 in Levites and Priests in Biblical History and Tradition, edited by Mark A. Leuchter and Jeremy M. Hutton. Ancient Israel and Its Literature 9. Atlanta, Ga.: Society of Biblical Literature, 2011. Albright, William F. “The Danish Excavations at Shiloh.” Bulletin of the American Schools of Oriental Research 9 (Feb. 1923): 10–11. Albright, William F. “The Danish Excavations at Seilun—A Correction.” Palestine Exploration Quarterly 59, no. 3 (July 1927): 157–58. Albright, William F. “Notes and News of the School in Jerusalem: Shiloh.” Bulletin of the American Schools of Oriental Research, no. 48 (1932): 14–15. Andersen, H. G., “The Site of Shiloh,” Palestine Exploration Quarterly 59 (1927): 85–88. Anderson, Fleming G. Shiloh II. The Danish Excavations at Tall Sailun, Palestine in 1926, 1929, 1932, and 1963: The Remains from the Hellenistic to the Mamluk Periods. Denmark: Aarhaus University Press, 1985. Batten, L. W. “The Sanctuary at Shiloh, and Samuel’s Sleeping Therein.” Journal of Biblical Literature 19, no. 1 (1900): 29–33. Buhl, Marie-Louise, and Svend Holm-Nielson. Shiloh, The Pre-Hellenistic Remains: The Danish Excavations at Tell Sailun, Palestine, in 1926, 1929, 1932 and 1963. Copenhagen: National Museum of Denmark and Aarhus University Press, 1969. Clifford, Richard J. “Zion and David a New Beginning: An Interpretation of Psalm 78.” Pp. 121–41 in Traditions in Transformation: Turning-Points in Biblical Faith, ed. Baruch Halpern and J. D. Levenson. Winona Lake, 1981. Clifford, Richard J. “Tent of El and the Israelite Tent of Meeting.” The Catholic Biblical Quarterly 33, no. 2 (April 1971): 221–27. Cody, A. A History of Old Testament Priesthood. Analecta Biblica 35. Rome: Pontifical Bible Institute, 1969. Cohen, Martin A. “The Role of the Shilonite Priesthood in the United Monarchy of Ancient Israel.” Hebrew Union College Annual 36 (1965): 59–98. Cross, Frank M. “The Priestly Tabernacle in the Light of Recent Research.” Pp. 169–80 in Temples and High Places in Biblical Times, ed. A. Biran. Jerusalem, 1981. Cross, Frank M. “The Tabernacle: A Study from an Archaeological and Historical Approach.” The Biblical Archaeologist 10, no. 3 (1947): 45–68. Day, John. “The Destruction of the Shiloh Sanctuary and Jeremiah VII 12, 14.” Pages 87–94 in Studies in the Historical Books of the Old Testament. Edited by J.A. Emerton. Leiden: E.J. Brill, 1979. Elitzur, Yoel and Doron Nir-Zevi. “A Rock-Hewn Altar Near Shiloh.” Palestine Exploration Quarterly 135 (2003): 30–36. Finkelstein, Israel, Shlomo Bunimovitz, Zvi Lederman, Salo Hellwing, and Moshe Sadeh. “Excavations at Shiloh 1981–1984: Preliminary Report.” Tel Aviv 12, no. 2 (September 1, 1985): 123–80. Finkelstein, Israel, Shelomoh Bunimovits, Zvi Lederman, and Baruch Brandl, eds. Shiloh: The Archaeology of a Biblical Site. Monograph Series of the Institute of Archaeology 10. Tel Aviv, Israel: Institute of Archaeology of Tel Aviv University, 1993. Chapter Index PDF. Fitzmyer, Joseph A. The One Who is to Come. Grand Rapids, Mich.: Eerdmans, 2007. Glueck, Nelson. “Palestinian and Syrian Archaeology in 1932.” American Journal of Archaeology 37, no. 1 (1933): 160–72. NOTE: On Shiloh (Seilûn) see pages 166-67. Glueck, Nelson. “Report of the Director of the School in Jerusalem.” Bulletin of the American Schools of Oriental Research, no. 52 (1933): 28–37. NOTE: On Shiloh see pages 30-31. Glueck, Nelson. “Shiloh.” Quarterly of the Department of Antiquities in Palestine 3 (1934): 180. Haran, Menahem. Temples and Temple Service in Ancient Israel. Winona Lake 1985. Haran, Menahem. “Shiloh and Jerusalem: The Origin of the Priestly Tradition in the Pentateuch.” Journal of Biblical Literature 81 (1962): 14–24. Hess, Richard S. Pp. 221-22 in Israelite Religions: An Archaeological and Biblical Survey. Grand Rapids, Mich.: Baker Academic, 2007. Kaufman, Asher S. “Fixing the Site of the Tabernacle at Shiloh.” Biblical Archaeology Review 14.6 (1988): 46–52. Kjaer, Hans Andersen. “The Danish Excavation of Shiloh.” Palestine Exploration Quarterly 59 no. 4 (1927): 202–13. Kjaer, Hans Andersen. “The Excavation of Shiloh.” Journal of the Palestine Oriental Society 10 (1930): 87–174. Kjaer, Hans Andersen. “Shiloh a Summary Report of the Second Danish Expedition, 1929.” Palestine Exploration Quarterly 63 no. 2 (1931): 71–88. Leuchter, Mark. “The Reference to Shiloh in Psalm 78.” Hebrew Union College Annual 77 (2006): 1–32. Lindblom, Johannes, “The Political Background of the Shiloh Oracle.” Novum Testamentum Supplements 1 (1953): 78–87. Niehaus, Jeffrey. “The Central Sanctuary: Where and When?” Tyndale Bulletin 43, no. 1 (May 1992): 3–30. Noth, Martin. “Samuel und Silo.” Vetus Testamentum 13, no. 4 (1963): 390–400. Richardson, A. T. “The Site of Shiloh.” Palestine Exploration Quarterly 57 no. ? (1925): 162–63. Richardson, A. T. “The Site of Shiloh.” Palestine Exploration Quarterly 59 no. 2 (1927): 85–88. Treves, Marco. “Shiloh (Genesis 49:10).” Journal of Biblical Literature 85, no. 3 (1966): 353–56. Wellhausen, Julius. Prolegomena to the History of Ancient Israel. Cleveland, Ohio: Meridian Books, 1957. Wood, Bryant G. “From Ramesses to Shiloh: Archaeological Discoveries Bearing on the Exodus–Judges Period.” In Giving the Sense: Understanding and Using Old Testament Historical Texts, edited by David M. Howard, Jr. and Michael A. Grisanti, 256–82. Grand Rapids, Mich.: Kregel Academic & Professional, 2004. Diffey, D. S. “Shiloh.” In The Lexham Bible Dictionary, edited by J. D. Barry, op cit. Bellingham, Wash.: Lexham, 2015. Andersen, H. G., “Shiloh,” Pp. 480–83 in vol. 5 of Zondervan Pictorial Encyclopedia of the Bible, Vols. 1–5. Revised, Full–Color ed. Tenney, Merrill C., and Moisés Silva, eds. Grand Rapids, Mich.: Zondervan, 2009. Finkelstein, Israel, and Aharon Kempinski. “Shiloh.” Pages 1364–70 in vol 4 of The New Encyclopedia of Archaeological Excavations in the Holy Land, edited by Ephraim Stern, Ayelet Levinson-Gilboa, and Joseph Aviram. Jerusalem, Israel: Israel Exploration Society, 1993. Gibson, Shimon, and Michael Avi-Yonah. “Shiloh.” Pages 478-79 in vol 18 of Encylopedia Judaica, edited by Michael Berenbaum and Fred Skolnik. New York, N.Y.: MacMillan, 2006. Halpern, Baurch, “Shiloh (Place),” Pp. 1213–15 in Vol. 5 of The Anchor Bible Dictionary. 6 vols. Freedman, David Noel, Gary A. Herion, David F. Graf, and John David Pleins, eds. New York, N.Y.: Doubleday, 1992. You will find a lot of good factual material on Shiloh. Some of the conclusions are from a minimalist perspective but the facts are good. Lapp, Nancy L. “Shiloh.” In HarperCollins Bible Dictionary, edited by Paul J. Achtemeier, Rev Upd., 943–44. New York, N.Y.: HarperOne, 1996. McGraw, Larry. “Shiloh.” In Holman Illustrated Bible Dictionary, edited by Trent C. Butler, Chad Brand, Charles Draper, and Archie England, 1487–88. Nashville, Tenn.: Broadman & Holman, 2003. Pfeiffer, Charles F., ed. “Shiloh,” Pp. 522–23 in Wycliffe Dictionary of Biblical Archaeology. Peabody, Mass. : Hendrickson, 2000. Taylor, John B., and J. Woodhead. “Shiloh.” In New Bible Dictionary, edited by I. Howard Marshall, Alan R. Millard, James I. Packer, and D. J. Wiseman, 3rd ed., 1094. Downers Grove, Ill.: InterVarsity, 1996. Youngblood, Ronald. “Shiloh.” Pp. 1220-24 in vol. 4 of New International Dictionary of Old Testament Theology and Exegesis. Edited by Willem A. Van Gemeren. Grand Rapids, Mich.: Zondervan, 1986. Modified Sept 30, 2017. Copyright © 2016 Electronic Christian Media.